When driving at PDX, Learn how to receive these trip requests and get in on the action. We’ve instituted a special queuing system at Portland International Airport. The queue only works within a designated area and driver-partners waiting elsewhere will not receive trip requests through the Uber Driver app. You may be asked to show your waybill. To access it, tap the “Info” button that appears in your app. Smoking is allowed only in designated areas and littering is prohibited. Uber’s technology uses a queuing process. This means that, in order to receive a trip request, you need to enter the designated waiting area, located within a specific zone. You will then be placed in a virtual queue, where you'll be able to receive a trip request. Based on the operating agreement with the airport, the waiting lot is located at 8157 NE Air Cargo Road (see map below). Proximity to the terminal within the zone does not create an advantage for driver-partners or move you closer to the top of the queue. If there are no driver-partners in the zone, trip requests will go to Uber driver-partners in the area -- based on proximity and other factors. 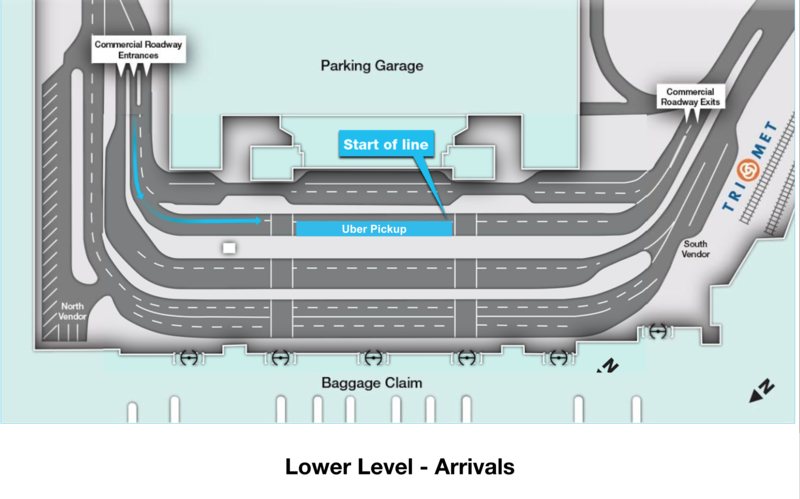 Once you accept a trip request, the pickup location at the airport is located on the lower level (arrivals) at the center of Island 2 after the Info Booth. (see map below). Please only use paved roads and avoid all construction access roads. 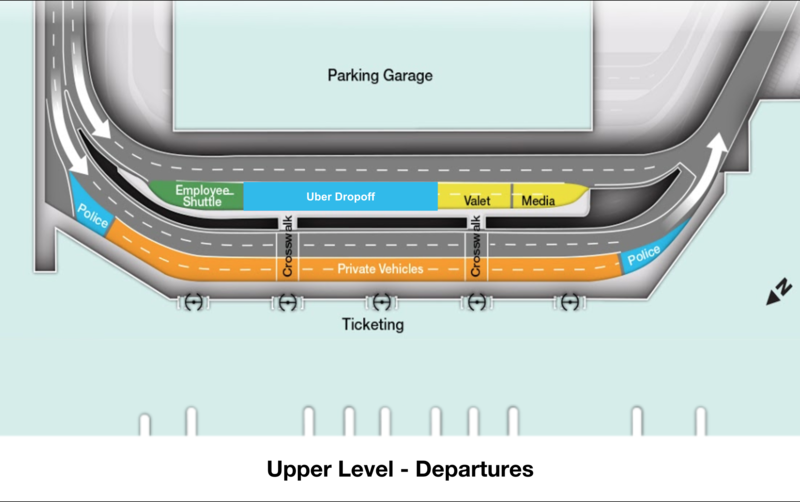 Based on the operating agreement with the airport, riders can be dropped off at on the upper level (departures) at the center of the outer roadway. If you’d like to receive a trip request afterwards, you’ll need to keep the Uber Driver app on to maintain your place in the queue. Uber partners may wait for ride requests at the designated staging lot only. You will not receive an airport request outside of this lot. Waiting outside of this lot may result in a citation. To access this area, please stay in the left lane that says "Commercial Vehicles" when entering the lower level. Be sure to use the center-lane to continue to island 2. Riders must be picked up at the center of island 2, in the highlighted area pictured. For more information, read more about the Portland International Airport. At PDX, simply drop off riders on the upper level on the outer roadway. It's important to keep the Uber Drive App on until you exit airport property. To access this area, follow the departures sign to the upper roadway, and use the left most lane (the outer roadway) to enter the "Commercial Vehicles" area. This roadway is just 50 feet from the terminal doors. Once in this area, pull foward as much as possible so that others can find space along the curb as well. 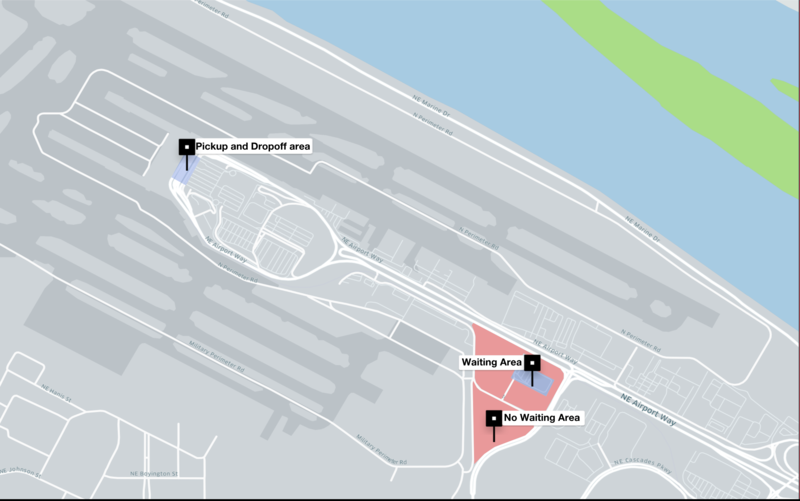 Please note—The airport may take enforcement action if dropoffs occur outside of the designated area. Checking the arrivals schedule at Portland International Airport can help you maximize your earnings with information about when flights will be landing at the airport and when it will be busiest.